The vehicle is equipped with a rear window defogger. Some models are also equipped with an outside mirror defogger and/or windshield wiper deicer. 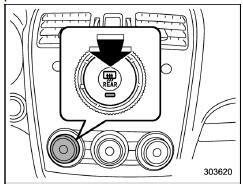 The defogger and deicer system is activated only when the ignition switch is in the "ON" position. To activate the defogger and deicer system, press the control switch that is located on the climate control panel. The rear window defogger, outside mirror defogger and windshield wiper deicer are activated simultaneously. The indicator light on the control switch illuminates while the defogger and deicer system is activated. To turn them off, press the control switch again. They also turn off when the ignition switch is turned to the "ACC" or "LOCK"/ "OFF" position. The defogger and deicer system will automatically shut off after approximately 15 minutes. If the rear window and the outside mirrors have been cleared and the windshield wiper blades have been deiced completely before that time, press the control switch to turn them off. If defrosting, defogging or deicing is not complete, you have to press the control switch to turn them on again. For models with the automatic climate control system (type B, C and D), it is possible for the defogger and deicer system to be set to continuous operation mode by a SUBARU dealer. Consult your SUBARU dealer for details. Also, for models with a multi function display, the setting can be changed using the display. For details, refer to "Multi function display" 3-42. If the battery voltage drops below the permissible level, continuous operation of the defogger and deicer system is canceled and the system stops operating. To prevent the battery from being discharged, do not operate the defogger and deicer system continuously for any longer than necessary. Do not use sharp instruments or window cleaner containing abrasives to clean the inner surface of the rear window. They may damage the conductors printed on the window. Turn on the defogger and deicer system if the wipers are frozen to the windshield. If the windshield is covered with snow, remove the snow so that the windshield wiper deicer works effectively. If the vehicle speed remains at 9 mph (15 km/h) or lower for 15 minutes, the windshield wiper deicer stops operating. However, the rear window defogger and outside mirror defogger maintain continuous operation. If the battery voltage drops below the permissible level, the defogger and deicer system stops operating.